One piece of black die casting aluminum housing clear organic glass lens 4.5" square 9-leds work light. Increases visibility during heavy rain, snow, fog and night time driving. Width : 4.25" / height : 5" (from top to bottom) / depth : 2.125". Led wattage : 27w / working voltage : dc 10-30v. Beam pattern : 100� flood beam angle. Lumen : 1800lm / color temperature : 6000k. Waterproof rate : ip 67. 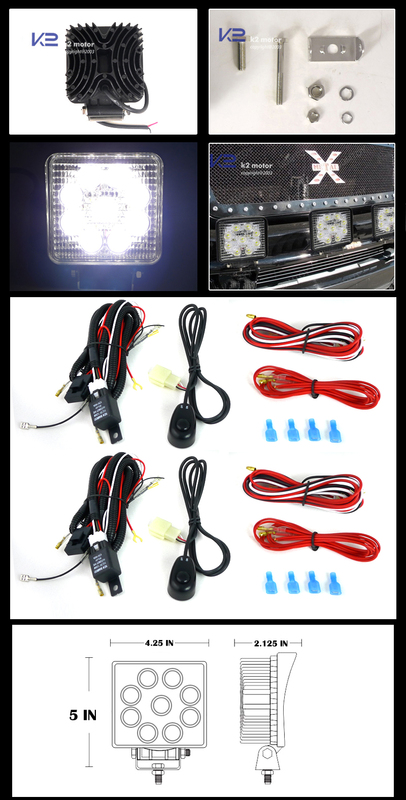 Comes with 4 x 9-leds work light, on/off switch, dual relay, wiring harnesses, stainless steel mounting brackets and necessary hardware. 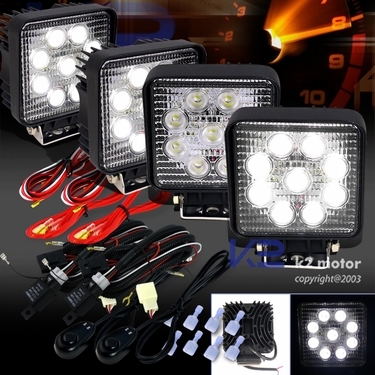 Brand New 2 Pairs of Square 6 LED Work Fog Lights + Wiring. This Set Of Fog Lights Will Help Improve Visibility During Night, Rain, Dense Fog And Snow. Try A Set Of Our High Quality And Easy To Install Fog Lights Kit! Made To Be Water Resistant And Shock Proof, This Set Of Fog Lights Is Also A Great Way To Customize The Look Of Your Car!